“There isn’t any word that is a bad word. They’re all just words. If it’s in the dictionary, it’s a word,” Babs says, speaking to no one in particular. It wasn’t meant to challenge anyone, just a mere statement of fact. Babs spoke dryly, enunciating each syllable. Ashley, in her late thirties and undoubtedly the youngest in the room, thought Babs might like reading from the dictionary, and that it was, perhaps, something she did in her spare time. Time, there was plenty of that. Ashley’s father, George, had just moved into the senior apartment living complex. The other apartment dwellers, while strangers, were encouraging them to sit down with them. Claudia and Ruth sat at the table kitty-corner to Babs, gossiping like naughty school children. Claudia, more quizzical, looked around the room after every other sentence she spoke, like a pent-up squirrel needing a vacation. “Why don’t we go for a walk today, along the bike trail?” Claudia asked. Babs smirked, “You know what I would have called him.” Claudia and Ruth both eyed her viciously. George, new to the apartment living complex, strolled over to his daughter with a cup of coffee and a pastry. “We handled it,” Ruth fired back at Babs. “That’s from Starbucks. They bring us pastries and muffins every morning,” Claudia said to Ashley and her father, excitedly. Her father attempted to sit down next to Ruth, but she had other ideas. “No one sits down here,” Ruth intervened. Claudia winced at Ruth, shaking her head at her. George, who is not one to back down from a challenge, picked up the chair, and placed it at the neighboring table. Claudia sipped her coffee gingerly. Ashley now didn’t know where to sit; with the three, grumpy old ladies or her lonely, solitary dad. If she sat next to her dad, they would be sitting with their backs to them. Somehow, this didn’t seem right. “As far as I know, witch is not spelled with a “B.” George said, smiling, delighted to be a part of the conversation. Well, he did teach English once. ‘Why don’t you just say what you want? Go ahead.” Babs was practically cheering her on. Ruth rose out of her seat and threw a muffin at Claudia’s head. Claudia gasped, speechless. 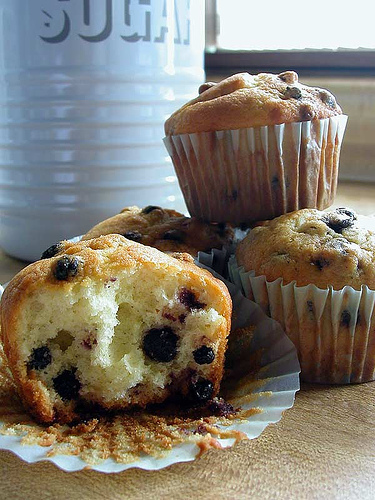 The muffin broke into fragmented pieces on the table before her, wayward crumbs floated on her hair. Ruth fled the scene, taking her coffee with her. “I guess anyone could sit there now,” said Babs in the stoney silence. “You know I would have called her something else,” she said to no one in particular. Ahahaha! I love the ending. My grandma’s in a senior living facility and I’ve witnessed some scenes similar to this one — uh boy! Good story. Oh, I bet you have your share of stories, then, Sandee. Thanks you! Thank you! She loves to ruffle the feathers. Laughing at this. I am visiting an assisted living facility tomorrow– this gem will keep me smiling. I wonder if I will have to duck from flying muffins? Thanks, Audra. They definitely have their own little world. Watch out for the muffins! Really good, I could picture it all! And more than that, I’m really pleased that I now know about photopin from the link in your photo credit! I have a site I get some royalty free photos from, but this photopin seems much simpler to use, and I see they even give you the code to use for the crediting them bit, fab, thanks! Thanks, Vanessa. I love photopin. It’s really the only one I use because it’s so easy. They have a pretty good selection I think. Also, yes, they do provide the code. I highly recommend it! Well, it’s true what they say, “High school never ends.” Nice piece! Thanks, Carrie! I think we all come around full circle. Thanks, Cathy. Thanks for your nice comments! I can’t wait to sit in that chair…no, yes I can! Thank, Red! I know…I can wait, too! I can’t wait to read Part 2 of your story. I will be over later. Thanks, Dianne! She’s the one who is completely in my head. If it was a good muffin, she wouldn’t have wasted it as a projectile. El Guapo, I know I wouldn’t have wasted it! No way. Aren’t muffins delicious? I worked with seniors for many years. I love their feisty little personalities. Great story! I think you captured that slice of life. Love he characters and dialogue, and little side references, ”he did used to teach English” etc. Thanks, enjoyed! Thanks, Managua! I appreciate it. Those ladies sound like some real firecrackers – I particularly like your Babs character, too! Word pictures galore! And I could almost smell the old man and old lady smells–covered slightly by muffins and coffee aromas. Thank you so much, Ly! I appreciate it. Well, that’s how the muffin crumbles. Thank you so much. Happy Valentine’s day! Old folks are always good for a laugh or two – and a little enlightenment and perspective. I’m amazed at how they really have their own set of rules. For many of them, it’s about starting over again. Who knew you would have to do that. I want to be Babs when I’m older. Thanks, Weebs. So, it shall be! How are you with this crazy storm? I’ve been thinking about you. I can’t believe you’re dealing with a blizzard!! Oh, wow…40s aren’t so bad, huh? Oh, good to know. I’m glad you’re safe! I hope it’s nice and sunny for you. This made me pee in my adult diapers!! This is high praise, your Magnificence! Thank you much.